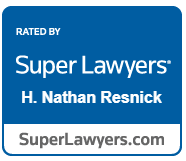 H. Nathan Resnick - Resnick Law, P.C. H. Nathan Resnick is the founding member and managing partner of Resnick Law, P.C., and heads the commercial litigation, real estate and corporate law practice groups. In addition to his busy practice and management responsibilities, Nathan also serves as a trustee to several trusts and manages commercial and residential properties. Upon graduating law school, Nathan joined the firm Thav, Gross, Steinway and Bennett where he honed his skills in the both the courtroom and corporate board rooms. 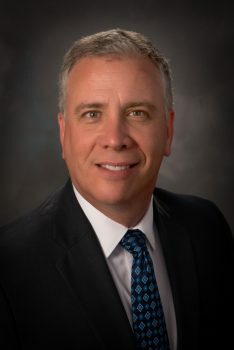 Having tried numerous cases in both federal and state courts, and representing individuals as well as companies in complex Chapter 11 cases in bankruptcy court, Nathan refined his skills to become a leader in his field. In 1993, Nathan decided to hang his own shingle, roll up his sleeves and found Resnick Law. As the firm has grown, adding several top-notch lawyers and paralegals along the way, Nate continues to practice the mantra that has led Resnick Law’s growth: give each client the time, energy and attention they are paying for and deserve. He never loses sight of the fact that his counsel to clients going through difficult and stressful times can make the difference in achieving their goals. While Nathan has extensive experience in bankruptcy and creditor’s rights, he is also well known for his corporate litigation skills in both state and federal court, as well as Tax Court. Nathan’s skills have earned him the respect of his peers and his reputation for not cowing to pressure, and taking a case to trial when necessary, has garnered him the admiration of both his colleagues and opposing counsel. Nathan has won jury trials and bench trials, and is known as a “bulldog” in the legal world because he refuses to back down from any case — even if his client is “the little guy.” Whether it’s flying to Germany, which he did at the request of a client to try a case or litigating in federal court, Nathan is a quintessential advocate for his clients’ needs. Former clients include well-known Fortune 500 companies as well as the second largest residential home builder in Michigan. He co-tried a construction case as defense counsel where the plaintiff was seeking $42 million. Nathan achieved a favorable outcome on the case with a verdict where his client only had to pay three percent of that $42 million demand. Moreover, even though this was considered a “win” for the client, Nathan appealed and won a complete victory in the Court of Appeals. After the appellate win, his client paid nothing and was awarded attorney fees exceeding $300,000. As an entrepreneur and business owner, Nathan brings more than just adroit legal advice to the table because he understands what it means to be both an employee and a business owner. He grasps what it takes to run a company successfully and tackle the day-to-day challenges of operating a business in the 21st century. Most important, Nathan knows how to roll up his shirt sleeves and get things done so his clients can get back to work and do what they do best. On a personal note, Nate is married and the proud father of two boys. He enjoys coaching his sons’ hockey and baseball teams. For the past several years, Mr. Resnick received an award from the Bankruptcy Court for his Pro Bono legal representation. America’s Most Honored Professionals goes to the top 1% professionals in the United States. It is awarded for “continuous professional recognition an accomplishment realized by the Top 1% of American Professionals . All qualifying public recognitions of excellence are certified by the American Registry and include significant mentions in the press and honors by recognized trade groups, and acclaimed recognitions by peers or clients. 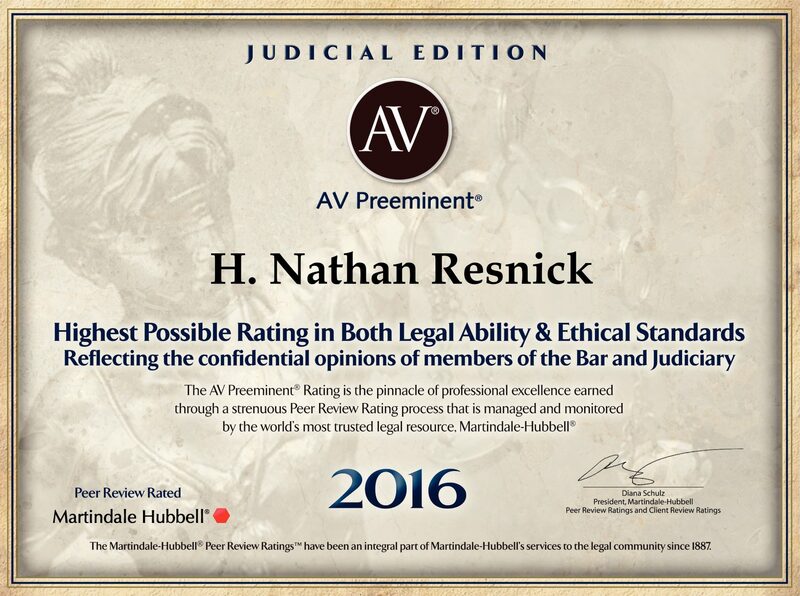 The AV® Preeminent Rating is the pinnacle of professional excellence earned through a strenuous Peer Review Rating process that is managed and monitored by the world’s most trusted legal resource Martindale–Hubbell®. Have Questions? Need Legal Guidance? Have your case reviewed by a Resnick Law attorney today! Attorneys at Resnick Law, P.C. serve clients in Bloomfield Hills, Metro Detroit, the Tri-County Area and throughout southeast Michigan, including: Oakland County, Wayne County, Macomb County, Livingston County, Genesee County, Washtenaw County, Lapeer County, St. Clair County, Birmingham, Rochester Hills, Rochester, West Bloomfield, Bloomfield Township, Novi, Royal Oak, St. Clair Shores, Grosse Pointe, Walled Lake, Ferndale, Berkley, Sterling Heights, Clarkston, Farmington Hills, Ann Arbor, Howell, Brighton, Mount Clemens, Flint, Grand Blanc, Livonia, Dearborn, Troy, Plymouth, Pontiac, Northville, Southfield, Warren and Utica. All materials and content in this Blog are provided for informational purposes only. Information contained in this Blog does not create an attorney-client relationship with Resnick Law, P.C. and any recipient of this Blog. The contents of this Blog, in whole and in part, are not to be construed as a legal opinion or legal advice. All materials and content in this Blog are provided for informational purposes only. Persons viewing information contained in this Blog should not act upon such information without first seeking appropriate and specific legal or professional consultation. Please contact an attorney at our office to obtain legal advice specific to your needs. Viewing of this website does not create an attorney/client relationship with Resnick Law, P.C. All materials and content on this website are provided for informational purposes only. These informational materials are not intended to constitute legal advice and should not be construed as such, because each person’s legal matters are unique and results will vary. The contents of this website do not reflect current legal developments, verdicts, settlements or specific client endorsements. Persons viewing information contained in this website should not act upon such information without first seeking appropriate and specific legal or professional advice. Please contact an attorney at our office to obtain legal advice specific to your needs.